Are cleaners disrupting your hormones? Changing your diet is a great way to start on the road to health and happy hormone balance. But your environment can also be a large factor in your own personal health. Taking a good look at the products you bring into your home is important. Indoor air pollution is a major problem for those of us that live in the US! 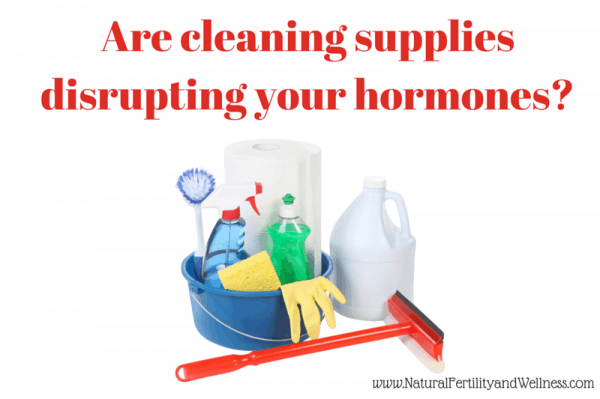 Toxic cleaners disrupting your hormones may have an effect on your cycle and fertility – let’s make sure the cleaning products you use are safe. Have you ever really looked at the chemicals you use in your own home? Unfortunately, many mainstream cleaning products (including everything from dish soap to toilet cleaners) contain a number of toxic and seemingly unnecessary chemicals. In fact, it might surprise you that out of 80,000 chemicals used for various activities throughout the United States, only about 5% have been tested for their effects on reproductive health. Conventional cleaners are full of toxins and chemicals that have been associated with birth defects as well as reproductive problems. Unfortunately, manufacturers are not required to place their ingredients on any sort of label. So let’s just look at some of the ingredients that are most common in products. Alkylphenolic compounds are surfactants and used in all-purpose cleaners as well as laundry detergent. These compounds have also shown to be endocrine disrupters, which means they mimic the hormone estrogen and cause problems with your hormones that regulate reproduction and the development of a baby. Perchlorethylene, or PERC is found in carpet cleaners, spot removers, de-greasers and also in dry cleaning fluids. This toxin is important to stay away from because when it is inhaled, it can actually be stored in our fat tissue (known as a bioaccumulative toxin). This toxin has also been shown to negatively affect babies in the womb as well as contaminate breast milk. Petroleum distillates are not only found in hand dish-washing liquid, paint thinners, stain removers, furniture polishes, and oven cleaners, but also in lip gloss and perfume. 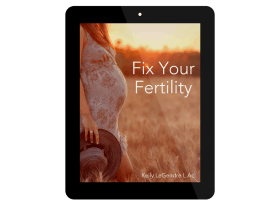 Exposure to this chemical can cause problems with the respiratory, immune, and most importantly for those trying to conceive, your endocrine system. Quaternary ammonium used as disinfectants, surfactants, fabric softeners, and as anti-static agents (e.g. in shampoos). In liquid fabric softeners, the chloride salts are often used. In dryer anti-cling strips, the sulfate salts are often used. Quaternary ammonium has been shown in more recent studies to lead to subfertility in mice. Phthalates are used as solvents (dissolving agents) for other materials. They are used in hundreds of products, such as vinyl flooring, adhesives, detergents, lubricating oils, automotive plastics, plastic clothes (raincoats), and personal-care products (soaps, shampoos, hair sprays, and nail polishes) (CDC fact sheet). Phalates are everywhere, so almost everyone in the USA is going to have some level of them, but those women with very high levels were shown to be twice as likely to experience implantation failure as women with low levels of phthalates found and has been shown to be linked to repeat miscarriages. Phalates impact male factor fertility, as well. As an endocrine disrupter, it can lower testosterone levels and also negatively affect the development of the male reproductive system when in utero. General health risks include hormonal imbalances, allergies, and asthma. Parabens emerged in the 1950’s as a way to prevent bacterial growth and ensure a longer lifespan for cosmetic and beauty products. In the 1990’s the paraben family of chemicals was identified as a xenoestrogen, a substance that mimics estrogen in the body. Repeat exposure to these chemicals can create a hormone imbalance that affects health. The Washington Post wrote about paraben exposure being linked to miscarriage, premature birth, birth defects, deficient sperm, obesity, metabolic disease, bone density and breast cancer. It’s difficult to pursue a definitive study on this chemical as doing so could put human participants at a great risk for long-term health issues. Sodium lauryl sulfate is a chemical agent that is used to break down surface tension and, in turn, allow health and beauty products to lather up and give us a foamy experience we’re all accustomed to when washing and caring for our bodies. The downside is that for children, even at low levels, is a known eye irritant and can harm their eye development. The brain, heart, and liver retain SLS in them for 4 up to 5 days after an exposure, which means that if you are using any products contain SLS chemicals, your body is under constant exposure. According to mercola.com SLS and SLES are often contaminated with 1,4 dioxane, a byproduct of the manufacturing process that is “possibly carcinogenic to humans” and may also cause negatives effects in the kidneys, liver and central nervous system. SLS exposure may be responsible for a variety of health problems from PMS and Menopausal symptoms to dropping male fertility and increasing female cancers such as breast cancer, where estrogen levels are known to be involved. So are these cleaners disrupting your hormones? While this list feels like “a lot” we’re really just scratching the surface. There are many, many more! But the gist of it is this: we’re bringing chemicals into our homes that get onto our skin (because many of us don’t wear gloves like the bottles recommend) and we breathe them in while we’re spraying and cleaning. Sometimes we might even ingest them if an object hasn’t been rinsed off appropriately. When we’re putting so much care and intentionality into bringing home the best food possible, avoiding pesticides whenever we can, we rarely extend the same care and consideration to our cleaning products, which we now know can be incredibly hazardous to our health. So how do you keep these hormone-disrupting chemicals out of your body? You keep them out of your home and use natural cleaners. Many of you even have these items in your home already! Here’s a cheap, natural way to keep your house clean. For an all-purpose cleaner, you can use straight up vinegar (or dilute it half and half if the smell is too strong for you) in a spray bottle. Add a few drops of essential oil if you’d like a bit more germ-fighting power and/or scent. And don’t worry about your home smelling like pickles, the smell vanishes rather quickly. *cost per bottle – .10 to .20 depending on dilution and EOs used. Have a tough cleaning job like a tub or messy stovetop? Sprinkle some baking soda around and spray with vinegar. Although this does work very well, you do need just a touch more elbow grease than when you use the highly toxic cleaners. Adding a bit of salt can give you extra scrubbing power as can a scrubby type sponge. For a great disinfectant spray the counter down with hydrogen peroxide and follow-up with straight vinegar. When using both together they somehow activate disinfectant properties. I love using this after I cook each night! (make sure you do not mix them beforehand, and always keep the hydrogen peroxide in a dark bottle. Otherwise, the hydrogen peroxide will break down and become “useless” water). 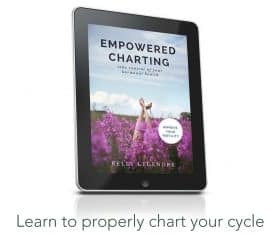 As you can see, with such a cheap alternative to toxic cleaners, there really is no reason to overload your home and body with chemicals that disrupt your hormones! Awesome to hear! I use a organic cleaner Basic H, becuase I wanted to get into the habbit of using good things before we even had a baby! Just found your blog! I am so glad! I am really looking forward to hearing from you. My husband and I have been married a little over a year and no baby yet! All in God’s time. From a natural doctor I have found some problems but am still trying to become all natural. It’s tough but we’re getting there! I’ll be back to see what’s new! I just recently switched to homemade and I really love it! I find my window cleaning solution took off the film I had leftover from Windex and left it streak-free! Kudos for the post! Nichole – I haven’t used Basic H, but sure here great things about it! Jody – Going natural sure can be a long road-but a little bit at a time is the way to go! donielle! this is such a neat site, thanks for taking the time to help others. i have a question for you: what do you do for dishwashing detergent and for laundry detergent? my experience with both was that the non-toxics didn’t work very well. also, what about the toilet?? Christina – currently I use Seventh Generation dishwasher and laundry detergent, although I’d like to play around with making my own. They can be pricey, but I’ve found them cheapest at Walgreens. The Seventh Generation site has a couple coupons to use that help too. I also use vinegar in the dishwasher for a rinse aid. As for the toilet, I actually just spray vinegar all around, let it sit for a few minutes (or 20 cause I always forget!) and use a normal toilet brush. Even with our hard water, it seems to work fine. A clean and healthy environment really helps in establishing a safe and well-loved home. These were all really great tips, thank you for sharing.